We all love software synths, but there's nothing quite like getting hands-on with a proper hardware instrument in your studio. Right now, the market for hardware synths is as buoyant as it's been for the past 25 years, with manufacturers catering for all budgets and tastes. At the lower end of the price scale you'll find compact synths that are capable of producing surprisingly big sounds. Some of these are inspired by classic synths from the past, but others are completely original designs. Go up a price bracket and you'll get more features and flexibility, not to mention better build quality. Some of the best synths represent a pretty serious investment, but these are objects of desire that you'll treasure for years for some. What's more, if you ever decide to sell, you'll likely get a good chunk of your money back. Just look at some of the old Roland, Yamaha, Korg and Moog classics on eBay for instance. There seems to be a slight shift away from the analogue revival of manufacturers rebooting old classics, with an eye now cast on hybrid engines, mixing synthesis with sampling. Some of the latest high-end synths to be released this year are melding both digital and analogue worlds with wavetable synthesis also getting in on the action. Let's not forget FM synthesis, which has also made something of a comeback, with its familiar crystalline, '80s-style sounds all over the radio right now. And there’s still a place for virtual analogue instruments in all of this, so you really are spoilt for choice. So, which is the best hardware synth for you? Based on our reviews, below you'll find MusicRadar's pick of the best models you can buy right now. We've got keyboards, modules, desktop and rack-mountable instruments, in all sizes, that span the price spectrum. All, though, come highly recommended. This new model slots comfortably into the Logue range between the original Minilogue and the Prologue 8. If we had to choose between this and the original Minilogue, it’d be the XD due to its more powerful sequencer, extended general versatility, user-customisable Multi-Engine/effects, the joystick for real-time control, user scales/tunings, more inspiring vibe and excellent motion-sequenceable stereo effects/output. Along with the new damper pedal jack and dual-CV inputs (to interface with modular gear), the XD is a nicely different flavour of Minilogue, and its unique personality is a hugely welcome addition to the range as a whole. Behringer’s synth arm might be best known for its controversy-courting ‘tributes’, but the German brand also has a couple of excellent original instruments under its belt. Following in the steps of last year’s Deepmind, Neutron is an analogue semi-modular that packs in a lot of flexibility for its very affordable price point. The Neutron has a few flaws, and there are some frustrating design issues, but it does sound good, and in terms of bang-for-your-buck, you can't really beat it. While it does a very good job of creating more sensible sounds, it also excels at the weird and wonderful. The Volca FM is a compact, battery-powerable instrument, housed in a plastic chassis with a design that gives a cheeky stylistic nod to the Yamaha DX7 from which it takes its sonic cues. It's equipped with a ribbon-style keyboard-come-sequencer, built-in speaker, MIDI input and 3.5mm sync in/out. This is easily the best of the Volca range so far. Where the other models have merely captured the general vibe of the instruments they took their inspiration from - albeit in a very fun and affordable way - the FM manages not only to nail the sound of its spiritual predecessor, but also adds an assortment of new and powerful features. It's not without its limitations - the lack of polyphony leaves it lagging behind the original DX7, Yamaha's Reface DX, and the various FM plugins out there - but the sound of those dark, percussive basses, icy mallets and '80s-style horns is bang on, and if you start to push the capabilities of this tweakable, hands-on little synth, you'll find it's capable of some truly unique tricks. At its heart, the Quantum is an 8-voice, bi-timbral (2-part) synth, using very high-resolution stereo oscillators routed through dual resonant analogue (or digital) filters. Sounds can be split and layered and voices can be allocated flexibly between layers; each layer can also have its own output for independent processing. Importantly, there are four independent synthesis engines (across the three oscillators). It is truly unique and capable of stunning, otherworldly, or familiar sonic results. It can sound huge, small, thin, fat, warm, epic, broken or cold and you can imprint your personality onto the sound using the available parameters, or your own samples. For ground-up, majestic sound design, SFX for lm/TV, weird evolving soundscapes, straight-up analogue synth emulation, FM-type sounds, and eery FX/atmos sounds, the Quantum is unbeatable. Yes, it’s pricey but it’s worth the investment - you’ll never get bored with this amount of depth and superb sonic results. The D-05 offers something a little different to the majority of the Roland Boutique range. Whereas most of the models to date have used Roland’s ACB tech to emulate the electronics of vintage analogue instruments, the D-05 takes as its basis the D-50, an all-digital ‘Linear Arithmetic’ (LA) synth that was first released in 1987. In terms of the basic architecture of the synth, the D-05 is pretty much an exact replication of the D-50. As before, patches are split into upper and lower ‘tones’ each of which comprises up to two partials. Each partial can be either a PCM sample or a synthesized sound created by the LAS engine. There are fresh features, too, most notably a 64-step polyphonic sequencer and multi-mode arpeggiator. It's not the easiest instrument to program, but we’ve fallen in love with this compact and sonically gorgeous recreation of a digital classic, and you might well do, too. The Prophet X brings a wholly new/welcome sound to Dave Smith’s lineup. Due to its flexible and open sample-based architecture and tried and tested synth engine, it can cover practically any sonic ground. Like the Waldorf Quantum, the price is high but similarly the X is using the latest technology in a really musical/elegant way, while simultaneously pushing you into new sonic approaches/territories. Build quality is solid; all the switchgear and knobs feel tank-like and very roadworthy. Prophet X’s 61-note velocity/aftertouch enabled keybed also feels very high-quality and, although it’s a little more stiffly sprung than the Prophet 6, this does give you more detailed control over the acoustic instruments and velocity-switched samples If you want a synth that can quickly get you close to the sonic complexity of your DAW’s plugins (but without the fuss), then this is it! Circuit Mono Station is, in loose terms, a hybrid of two of Novation’s best instruments: a combination of the meaty analogue synth engine of the Bass Station II, and Circuit’s excellent sequencer. Housed in a chassis similar to - but slightly taller than - Circuit, Mono Station’s interface is roughly divided in half, with the upper section housing the synth controls and the lower portion controlling the sequencer. Mono Station is equipped with a decent array of ins and outs, while the deep, multi-channel sequencer, flexible mod matrix and automation all add up to a workflow and creative experience unlike anything else on the market, combining the best of digital flexibility with a classic analogue synth design. The end result is much more than the sum of its parts, and at this price point this is a must-try synth. Where the original was a fairly straightforward monosynth with a few unique touches and some CV control, the MiniBrute 2 is semi-modular, boasting a beefed- up synth engine and a comprehensive mini-jack patchbay. As before, the primary oscillator can generate saw, triangle and square waves simultaneously, the outputs of which are blended via the oscillator mixer, where they’re joined by a white noise source and external audio input. Filter-wise, the MiniBrute 2 keeps the Steiner-Parker-style filter of its predecessor, which offers -12dB low- and high-pass modes, plus -6dB band-pass and notch filtering. On the whole, the MiniBrute 2 is a real success. It takes everything we liked about the original - the analogue grit, interesting oscillator shaping and Brute factor control, which overdrives the signal chain using a controlled feedback loop - and expands on it considerably. A serious competitor, then, and the same can be said of the MiniBrute 2S, which swaps the keys for a pad-based step sequencer. Digitone uses good old familiar four-operator FM synthesis (where waves modulate each other) but with some very welcome new twists and turns. The native FM engine is eight-note polyphonic and has four dedicated tracks (accessed directly via the sweet shop style T1-T4 buttons), along with four MIDI tracks for controlling/sequencing external MIDI gear. Once the Digitone’s FM sound engine is coupled to the Elektron’s fantastic sequencer design, the whole thing just comes alive. You’ll soon be wondering why anyone thought FM was difficult to use or old-fashioned sounding. Of course, you can use the Digitone as a simple sound module triggered from a MIDI controller, DAW or the onboard 16-step buttons to play simple old-skool FM impersonations, but it’s once the sequencer, modulators and filters are employed (and the excellent effects overlayed or ‘P-locked') that the Digitone shows its true and superb colours. The original Waldorf-powered Sledge launched in 2012 and, despite being pretty reasonably priced and offering a very solid synth engine, largely fell under the radar. However, v2.0 is a significant upgrade. There's no doubt that the Sledge's front panel has been largely influenced by the Minimoog with its classic three-oscillator plus filter plus dual envelope layout. It's a great choice of design as it's very familiar to most people and flows very nicely. Throw in wavetable and sample import options, plus FM, 24-note polyphony, split/layering facilities and aftertouch support, and Sledge starts to look like a great buy. A black version with several new features is now available, too. Behringer’s first analogue synth is polyphonic to the tune of 12 simultaneous voices, and with a metal case and wooden side panels, it looks like the real deal. While DeepMind is certainly interactive and powerful, it lacks the immediacy of some of the simpler classics, such as Roland’s Juno-106 or Jupiter-8. That said, this is an impressive first entry into the synth arena for Behringer. Unlike some of its previous products, this is not a cut-price clone, and delivers its own take on what a £1,000 analogue polyphonic synth should be. Throw in the free cross-platform editing software, 1,024 onboard presets and a three-year warranty, and you have an alluring package. Moog’s latest semi-modular comes equipped with a 32-note Fatar keyboard, sequencer and arp, making it more performance-focussed than its siblings in the Mother line. It has a chic multi-coloured retro design that suits its authentic vintage sound. The old-school approach is rounded off nicely with the inclusion of a spring reverb module – a rare inclusion in modern synths. Grandmother is a versatile performer, capable of a vast range of sounds even before patching a cable. Is it worth the asking price? Absolutely, if for no other reason than providing users with a taste of those old Moog modular circuits without having to take out a second mortgage. The look of Uno may prove a bit divisive. Its slanted profile and push button control panel have a retro charm, but it’s a design that brings to mind the early days of home computers more than any vintage analogue synth. The lower part of the push button interface is taken up by a 27-note ‘keyboard’ for live playing, or to input notes for the onboard sequencer or arpeggiator. Despite all of this, Uno is an excellent-sounding, versatile analogue monosynth, and you do get a lot for your money. The presets offer a ton of highly usable sounds, and we could certainly see this becoming a go-to instrument for classic basses and leads. The arp and sequencer are great for inspiring ideas, and a software editor adds to the allure. if you can cope with a few compromises, Uno is a great source of classic, punchy analogue sounds at a bargain price. Designed in consultation with Chris Hugget (Chris designed the legendary OSCar and collaborated on several other Novation synths), Peak is Novation’s current flagship synth. Peak is an 8-voice polyphonic, 24 ‘Oxford’ oscillator, monotimbral synthesizer, utilising extremely high-resolution anti-aliasing digital oscillators (NCOs) along with wavetables as its main sound sources. Each of the three oscillators onboard offers up the expected analogue-style waveforms (the saw has a density mode, effectively giving you a ‘supersaw’ mode), plus 17 wavetables, giving a vast range of tonal possibilities. Peak has a lot in the way of sonic shaping options, a unique and huge tone palette that’s suitable for all styles of electronica, and plenty of hands-on control. Plus, it’s well-built and fairly priced. Kudos to Novation on an impressive machine! Designed by the AIRA team (a separate division within Roland), the System-8 can be viewed as the System-1’s big brother and then some. It’s an eight-voice ACB-powered polysynth with its own powerful native engine, accompanied by the Plug-Out slots into which you can place your choice of any three Plug-Outs from the Roland Content Store. 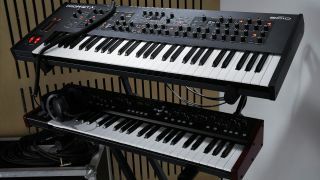 The S-8 ships with Plug-Out versions of the Jupiter-8 and Juno-106, arguably Roland’s two best-loved polys. The S-8 engine offers a versatile setup that’s capable of a huge range of tones, from future-electronic to classic vintage, and it all sounds precise yet warm and musical. Throw in audio interface/CV capabilities, a sequencer and a decent vocoder (plus audio inputs with dedicated FX) and it’s hard not to be impressed. Given Roland’s fine history of analogue polysynths, the larger of the company’s two ‘crossover’ keyboards had a lot to live up to when it was released in 2015. Happily, it delivers. The JD-XA is hugely versatile. It can act as a powerful analogue and hybrid mono/polysynth, and features one of the nicest vocoders we’ve used. There are plenty of modulation options onboard, the global and insert FX and new analogue filters sound great, and it’s a powerful MIDI control surface to boot. This is a great keyboard to have at the centre of any setup - either live or in the studio. Hats-off to Roland for making one of the most inspiring and unique-sounding synths of recent times. The OB-6 is a 6-voice synth with an all-analogue signal path and discrete VCOs and filters. It was developed in collaboration with Tom Oberheim, and boasts a sound engine that's inspired by his original SEM. In fact, the OB-6 promises "true, vintage SEM tone with the stability and flexibility of modern technology". The architecture features two oscillators per voice, with continuously variable waveshapes (sawtooth and variable-width pulse, with triangle on oscillator 2). Each voice also has access to a SEM-inspired state-variable filter (low-pass, high-pass, band-pass, and notch). Completing the signal path are voltage-controlled amplifiers. Throw in a powerful modulation system, dual effects section and knob-per-function front panel and you've got a top-dollar synth that will keep you entertained for years to come. The Sub 37 is a duo/paraphonic limited edition synth based on the Sub Phatty engine. Dubbed the Tribute Edition - in honour of Bob Moog himself and his love of education - each Sub 37 sold has a portion of the proceeds donated to Asheville Area School Music Programs. While both this and the Sub Phatty have their own unique characteristics, for Moog lovers the real boon here is the inclusion of the arpeggiator, something not even featured in the massive Voyager XL, let alone other Phattys. In fact, with a richer set of features and far fewer operational hurdles than its predecessor, the Sub 37 is superb. You can also check out the Subsequent 37, a limited edition version of the synth that offers (among other things) four assignable CV outputs and two assignable Gate outputs for connectivity with modular systems, including those of the Eurorack variety.